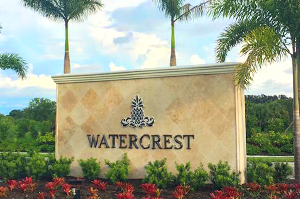 Watercrest is a development of Sarasota-based Vanguard Land, which is also one of the prime movers of the master-planned West Villages that has vastly expanded the inventory of North Port and Venice homes for sale. Vanguard Land developed Watercrest with a resort-style theme and platted it for 423 home sites which have been sold to builders. It has also put in the pipeline the development of 187,000 square feet of commercial space in this community’s prime acreage at the northeast corner of Jacaranda Boulevard and East Venice Avenue. Watercrest homes for sale are builds by Lennar Corp. and WCI Communities that Lennar acquired in 2016. Sales and marketing in this community started in late 2016, and its clubhouse and two model homes were unveiled in July the following year. Watercrest is a gated community which could impress even the most discriminating buyers of Venice homes for sale. This community’s clubhouse was constructed in a charming British West Indies architectural style, featuring a floor area of 3,146 square feet. The facilities it provides include a well-equipped and spacious fitness center, a zero-entry swimming pool, bocce ball court, outdoor fireplace, an outdoor entertainment area and restrooms. A non-CDD and maintenance-included community, Watercress strengthens its market presence eve more in Lennar and WCI’s wide selections and their wonderful plats. These home sites either abut one of the property’s four lakes or are back up to a nature preserve. The kingpin of WCI’s offerings at Watercrest is its Key Largo model entered in the 2017 Manatee Sarasota Parade of Homes. This model belongs to this builders Grand Villas series and is designed with a floor area of 2,389 square feet featuring three bedrooms, three baths and a half-bath within. The price points of these residences are quoted in the $300s up to the $500s. WCI is also offering its Cottage Homes designs in Watercress. One of the models in this series, the Areca G, was likewise featured in the 2017 regional home showcase. This model is designed with two bedrooms and two baths within a floor area of 1,557 square feet. Its pricing of this model starts at the high $200s. Lennar, on the other hand, has fielded amongst Watercrest homes for sale its executive home series with floor plans in the 1,677‒3,357-square-foot range. These designs offer choices of three to five bedrooms and two to three baths, with their pricing in the upper $200s up to the $300s. 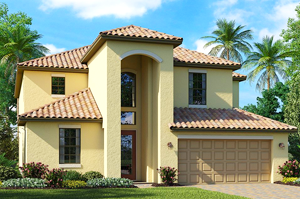 Twin villas from Lennar are also available in Watercrest, which come with floor areas of 1,417 to 1,564 square feet set for two bedrooms and two baths. Their starting prices have been pegged in the low $200s. The attractive price points of Watercrest homes for sale are complemented by their convenient location just across northeast of the Publix-anchored commercial hub of Jacaranda Commons. Westward, the Venice Avenue corridor provides easy access to Venice Island together with its historic downtown and neighboring beaches. Interstate 75, which is less than a mile north of the community, opens even more local points of interest that further generate market interest on Watercrest homes for sale. Below are the current real estate listings available at Watercrest.